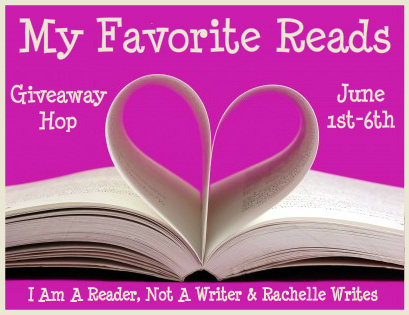 Welcome to My Favorite Reads Giveaway. I Am A Reader, NOt A Writer & Rachelle Writes. ONE of my favorite reads so far this year. You need to fill out the form below. I will email the winner at the end of the contest and he/she will have 48 hours to respond before I choose another winner. This is open to anyone that Amazon or The Book Depository will ship to. Be sure to visit the other giveaways! I'm sorry that I haven't posted anything recently. I've been meaning to but the end of year craziness has kept me busy. Especially with the school's centennial celebration and end of year reading carnival. 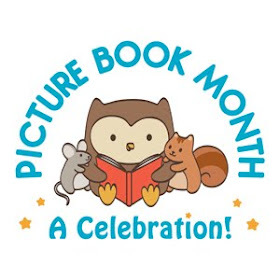 I'm going to try to get a couple of more posts up this week, especially with the My Favorite Reads giveaway coming up, so be sure to check back later this week as I highlight my favorite graphic novels and favorite picture books. Also, I want to mention a fun giveaway being hosted by Jennifer A. Nielsen at her website, the author of the fabulous The False Prince, see here for my review. 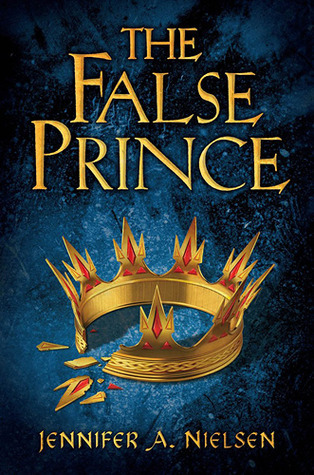 She is offering THREE signed copies of The False Prince, along with a grand prize of a copy of the book and a Skype visit. All you need to do to enter is leave a comment on her post and guess what the main color will be for the second book in the series. This is a great book so I encourage you to enter. Congratulations! And thanks to all who participated. The winner has been emailed and has 48 hours to respond. 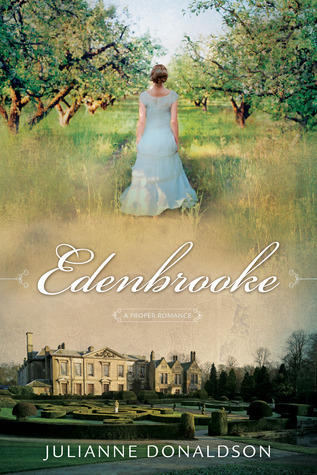 Reviewed from e-book copy sent by author. My review is solely my own. I have to be honest here. This book sounded really great when I first heard about it and the reviews I have read about it are primarily very positive. But I was unable to finish it. However, keep in mind that I am one of those who refused to read Twilight so paranormal is not my favorite genre to begin with. 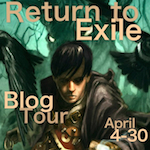 For the right reader, this book clearly does very well, please make sure you continue to follow the blog tour and read the other reviews. If you choose to keep reading my review, I will clarify what I did like of what I read and what I had a hard time with. 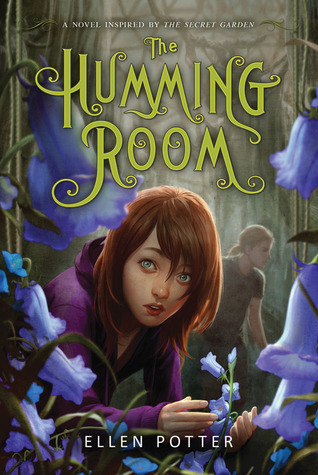 What I Liked: I liked the school and the secrets contained therein. Maybe it's a leftover liking from Harry Potter and Hogwarts. Or maybe it's the fact that I work in a school, but I do enjoy stories that take place in schools. There is so much potential for conflict and challenges. I also liked the subtle clues that lead Michelle to realize that there is something different about this school and it's attendees. Elliot and his companions were definitely appealing, intriguing characters. What I didn't like: So much of what I read felt like telling rather than showing. For example, the author explains, "Michelle was sitting on the bleachers talking to Anna about the upcoming softball season. Anna was wondering if Michelle would be interested in joining the team. Michelle wished that she had the same energy that Anna had." Where is the actual conversation? I also didn't find Michelle to be a particularly likable character. I also had to wonder, what common ground do she, at 17, and Elliot at who knows how old, have? Their experiences are so different. Would such a relationship really last very long? I also didn't appreciate the trickery Michelle used to try to find out more about Elliot and the school. It didn't seem in keeping with her so-called good girl image. Several issues were brought up and then dropped, for example, her struggles in Italian that were mentioned and then dropped completely from the story line. I also had a hard time with a mother who seems very caring at one moment and then takes her sick daughter to the mall the next. 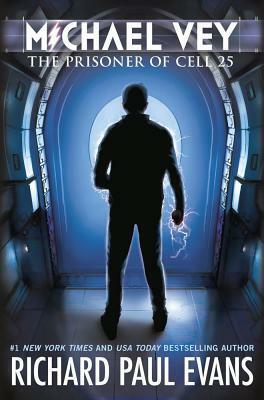 Overall, I thought there was a lot of potential, but I didn't enjoy what I read enough to keep going. 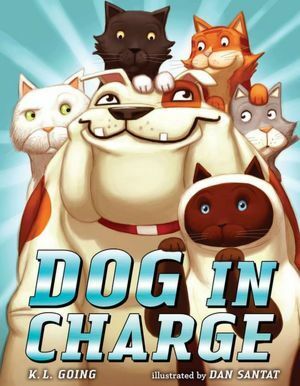 But when he's in charge, can he keep the cats in line? All one, two, three, four, five of them? With slapstick silliness and utterly earnest charm, Dog will quickly wiggle his way into preschoolers' hearts. I had a good time sharing this with the kindergartners I see every week. It made for a great discussion of feelings and nonverbal communication. Plus, it's just a fun story. I imagine a lot of parents feel like dog, after a day of running after children who make one mess after another, only to have the child or children turn around and do something sweet. I know in my job that is often the case. I get really frustrated and than one child does something nice making the frustration lesson. 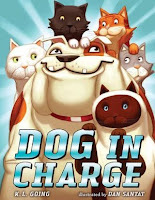 Anyway, the kids just enjoyed it as a fun story about a dog and a bunch of mischievous, mess-making cats. 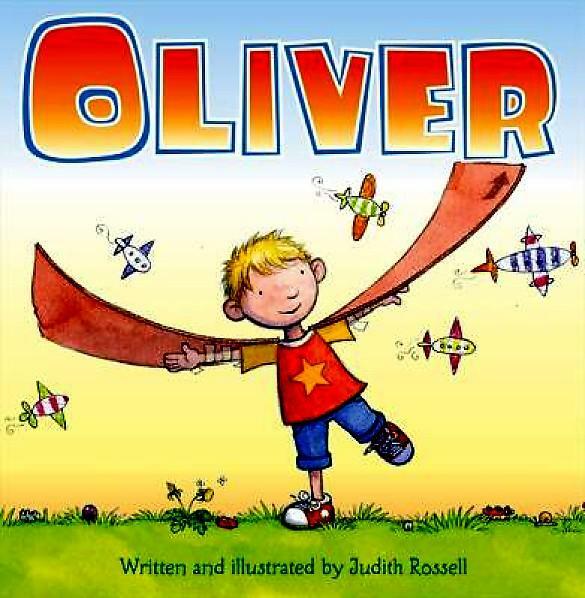 I always appreciate books that encourage children to use their imagination. Maybe it's because I spent many happy hours as a child visiting and doing things in my own imagination and I know how fun it can be. 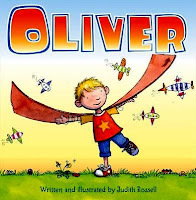 In this story, Oliver loves to explore and ask questions. He asks things like, "How does the fridge work?" and "Could a penguin live in our fridge?" Then as he takes a bath, he takes an imaginary journey down the drain, where he meets a bunch of penguins on vacation. This was a fun read. 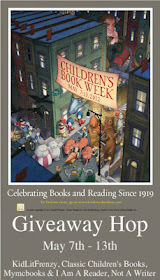 Children's Book Week Giveaway Winner! 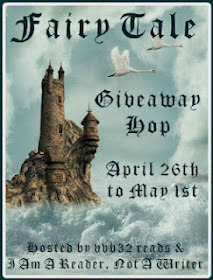 It's time to announce the winner of my Children's Book Week Giveaway. Thanks to all those who participated. I enjoy reading your comments. With the 100th anniversary of the sinking of the Titanic being memorialized this year, there has been an influx of new books on the topic, both fiction and nonfiction. This is a perennially favorite topic among my students so I'm sharing some of the ones I've read. 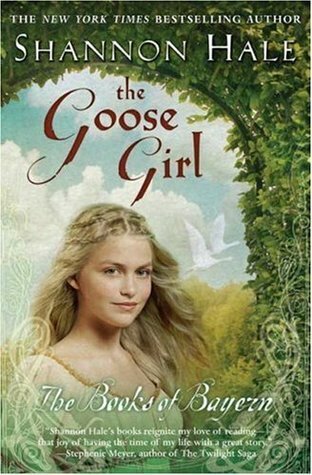 Today I'm highlighting two nonfiction books, later this month I hope to highlight several fictionalized stories. 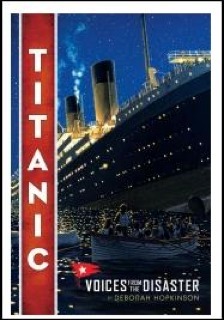 See here for another nonfiction book on the Titanic. Only 160 minutes passed between the time a sailor on lookout duty uttered these chilling words and the moment when the mighty ocean liner Titanic totally disappeared into the cold, dark waters of the North Atlantic. This century-old tragedy, which took more than 1,500 lives, still captivates people in the twenty-first century. Seventy-three years separate the two major Titanic events--the 1912 sinking of the vessel and the dramatic 1985 discovery of the wreck by Robert Ballard. But additional stories about the victims, survivors, rescuers, reporters, investigators, and many others show the far-reaching effects this tragedy had on society. Award-winning author Stephanie Sammartino McPherson has collected numerous personal accounts of the event, including the knighted man who spent the rest of his life in seclusion because he was accused of dishonorable behavior in a lifeboat, the stewardess who survived two shipwrecks and a mid-ocean collision, and the New York Times executive who sent multiple reporters to meet the rescue ship, thus earning a national reputation for his newspaper. She also links the Titanic tragedy to changes in regulations worldwide. After a Senate Inquiry and a British trial attempted to assign blame for the disaster, new laws on ship safety were put in place. A group of nations also banded together to form an ice patrol, eventually leading to the formation of the U.S. Coast Guard. Even the most avid Titanic fans will learn something new as McPherson brings the reader up to date on the politics and intrigue still surrounding the wreck--including what modern science can reveal about what really happened to the ship and who was at fault. 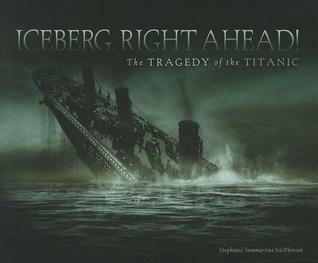 Prepare to follow the never-ending story of the Titanic into its second century. This book is fabulously done. It is definitely going on my shelf of favorites. Not only is the writing crisp and easy to read, but the whole design is beautifully done. The photographs, illustrations, and sidebars are placed so that they add to the overall design but don't interrupt the flow of the narrative. This is the sort of nonfiction that would work really well as a read-a-loud. One of the things I especially appreciated were the sidebars explaining some of the things we are still learning about the Titanic and why she went down. For example, on page 10, the author points out that ideas are changing about just what damage the iceberg did to the ship. From the beginning, it was assumed that the iceberg created a 300 foot long gash in the starboard side of the ship. But a new theory suggests that was not the case, instead the rivets gave way creating hundreds of small holes. The water pressure was so great that it forced water through these holes at a remarkably fast pace. I highly highly recommend this book. This book is also very well done. Hopkinson does a great job of merging the experiences of some of the survivors. The addition of historical photographs and documents adds to the reading experience, makes it seem more immediate. I appreciated how she blended explanations with actual quotes. The text is quite readable and would make a great nonfiction read-a-loud. Books like this help children see that history doesn't have to be dry and boring. The real stories of survivors are heartbreaking in their starkness. My heart ached for those who left loved ones behind. The thing I find fascinating about this kind of story is not the disaster itself, but the way people react to it. Hopkinson doesn't shy away from stories of cowardice as well of heroics, but she doesn't judge, she simply presents what is known about the different people and lets the reader make up his/her own mind. This is hard to accomplish since looking back it is so easy to judge people and their mistakes. I highly recommend this book for those looking to learn more about the people involved in the disaster. Head on over to Ms. Yingling Reads for today's Nonfiction Monday. I have to confess that I picked this book up because of the cover. 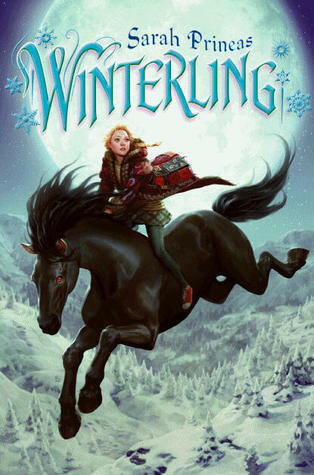 I love that cover, I mean a gorgeous black horse with blazing red eyes. I found it very intriguing. I wish I could say the book lived up to the cover, and it does come close, but there were a few things I would have liked to see more of. I would have liked to see more character development. I did like Fer and I admired her spirit and pluck, but I didn't feel a really strong attachment to her. 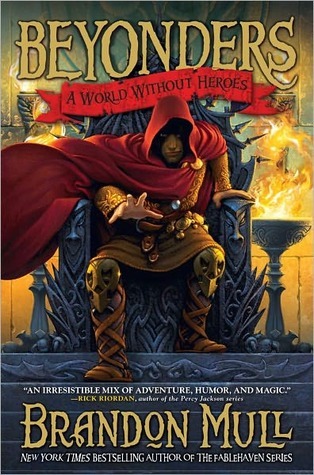 Rook was an interesting character, a puck bound by oath to Mor. I enjoyed getting to know him, but I would have appreciated having more background to better understand him and where he was coming from. I did find the relationship between Fer and Rook an interesting one, with Fer considering him a friend despite his bond to Mor. And I loved that Fer was both strong and kind, offering healing to the injured. The world that Prineas creates is a fascinating one. The connection between the seasons and the behavior of the inhabitants I found especially appealing. Maybe because it mirrors our own connection to our earth and the good and not so good ways we interact with it. The plot is the best part of the book, moving along at a nice clip. 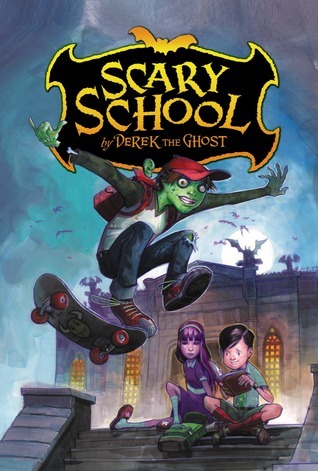 This is what I think makes the book especially appropriate for elementary students, they tend to appreciate fast moving plots more than I. I was like that when I was younger also. As I've gotten older, I've grown to want more depth in what I read. 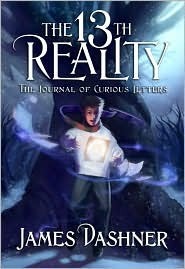 But this book provides a fun, entertaining read perfect for young readers not quite ready to take on Harry Potter or Percy Jackson. 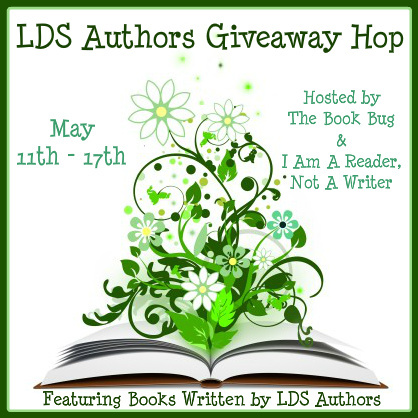 Welcome to my LDS Authors Giveaway. Being LDS and having a special fondness for LDS authors I am excited to participate in this giveaway. This hop is being hosted by The Book Bug and I Am A Reader, Not a Writer. 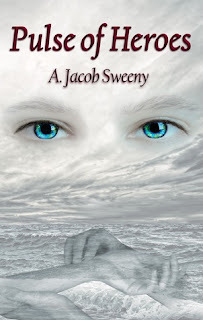 ONE BOOK BY AN LDS AUTHOR! Here are some websites you can use for ideas as well. Winner will be contacted with 48 hours after the end of the giveaway. The winner will have 48 hours to respond to my email, otherwise a new winner will be chosen. Be sure to check out the other giveaways listed at the bottom of this post. Once again I have some picture books to share. 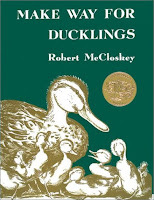 I used these books with four classes of kindergartners. Each book works well as a read-a-loud and one even got the kids giggling madly. Explore the world of color with Baby Bear!Baby Bear has so much to learn about the world! From the moment he wakes until it’s time to curl up and go to sleep, he explores outside with his mama. They see green leaves, blue jays, brown trout, and—best of all—a patch of yummy red strawberries.From bestselling picture book creator Ashley Wolff, here is a clever concept book that combines engaging and intricate linocut illustrations with a story that enthusiastically encourages children to identify a variety of vibrant colors. Young readers will delight in this chance to join Baby Bear as he discovers the colorful wonders of his lively, leafy forest home. This is one of my favorite picture books published this year. 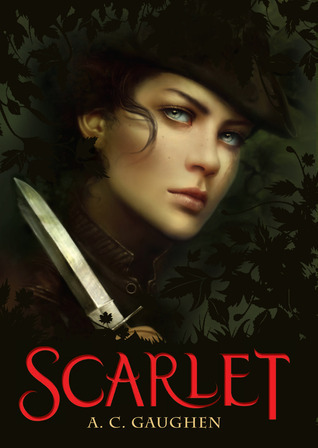 Not only are the illustrations amazingly gorgeous, but the text reads smoothly and simply. I also appreciated how patient Mama Bear is with her very curious cub. She answers all his questions and lets him explore, but she is nearby should he get in trouble. This is a great book for teaching children to really see the world around them and the sights and smells that bring that world to life. It also makes for a tender bedtime story. It also works as a read-a-loud and is perfect for teaching about colors. Highly, highly recommended. I wouldn't be surprised if this book got some award love, in fact, I hope it does. 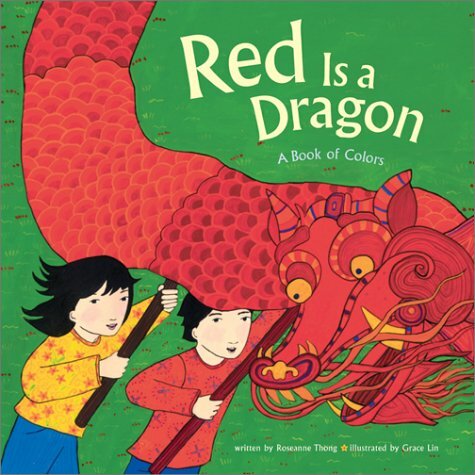 Discover shades of red, orange, yellow, green, blue, and more as a little girl finds color in all sorts of everyday things. Many of the featured objects are Asian in origin, others universal: red is the dragon in the Chinese New Year parade, green is a bracelet made of jade, and yellow are the taxis she sees on her street. 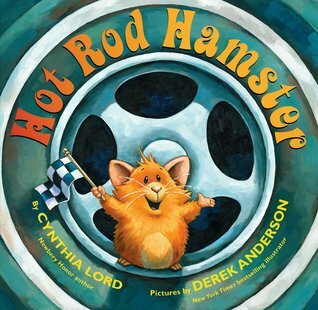 With rich, boisterous illustrations and colors that leap off the page, this concept picturebook will brighten every child's day! I'll say right off that I am a huge Grace Lin fan. I enjoy the bright colors she uses in her artwork. Her style works especially well for this book about colors. The predominant color on each page is the one being highlighted, but she uses differing shades so the pages stand out. The color being highlighted is obvious, but not too obvious. I also really like the ending that shows a wider perspective including some of the colors and places mentioned on previous pages. This book provides a delightful reading and seeing experience. 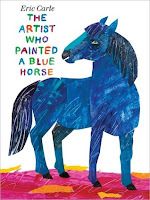 Every child has an artist inside them, and this vibrant picture book from Eric Carle will help let it out. The artist in this book paints the world as he sees it, just like a child. There's a red crocodile, an orange elephant, a purple fox and a polka-dotted donkey. More than anything, there's imagination. Filled with some of the most magnificently colorful animals of Eric Carle's career, this tribute to the creative life celebrates the power of art. I love the theme behind this book. The idea that just because something is usually done in one way, doesn't mean it is wrong to do it another way is an important theme. Children especially are vulnerable to the idea that there is only one way to do something. This book helps counter that idea, by suggesting that exercising our creativity is a good thing. The illustrations are typical Carle, simple in shape, yet complex in design. Of course children aren't going to see most of that. The classes I shared this with giggled through the whole read-a-loud. This is undoubtedly because the animals are different colors than one would see in the real world. Not only is there a blue horse, but a yellow cow, a pink rabbit, a green lion, and an orange elephant. I highly recommend this book for sharing and teaching. Die cut pages bring surprise after surprise in this magical new book from the "Queen of the concept book"—an intricate and satisfying homage to green, the color of all creation. How many kinds of green are there? There's the lush green of a forest on a late spring day, the fresh, juicy green of a just-cut lime, the incandescent green of a firefly, and the vivid aquamarine of a tropical sea. In her newest book, Caldecott and Geisel Honor Book author Laura Vaccaro Seeger fashions an homage to a single color and, in doing so, creates a book that will delight and, quite possibly astonish you. Seeger never ceases to amaze me with her creativity and skill. Here is another deceptively simple yet fascinating look at the world around us. 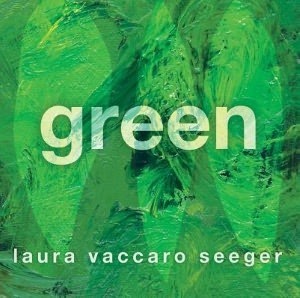 Seeger shows us the beauty and versatility of the color green. Each die cut changes form on the next page. For example, the book starts by showing a forest with two die cut leaves. When you flip the page, the die cuts have become fish. The kindergartners I shared this with were fascinated by the way the shapes stayed the same but became something else, through the changes in color and location. A delight from beginning to end. Fill out the rafflecopter form. The winner will be notified on Monday, May 14th. They will have 48 hours to respond or I will choose another winner. I've got some winners to announce for a couple of giveaways. Thanks to all who participated. 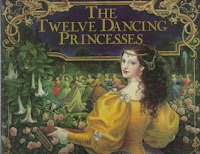 It was fun for me to here about all the different fairy tale-based books there are available now. I'll have to find time to read some of these. Of all the top lists I've created this far, this one is the least definitive. 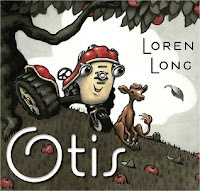 There are so many great picture books out there and I am always discovering new ones. I've tried to include a variety of topics and illustration styles, but I'll admit right off the bat that I have a particular place in my heart for gorgeous, elegant illustrations. 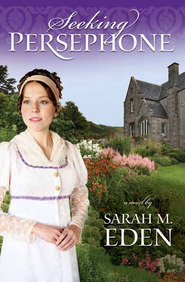 Both Ruth Sanderson and K.L. Craft are particularly good at this style of illustration. I had a hard time choosing from among their books, as you can see I am highlighting two of Ruth Sanderson's. So, here we go, in no particular order. All summaries come from Goodreads. It's not easy for duck parents to find a safe place to bring up their ducklings, but during a rest stop in Boston's Public Garden, Mr. and Mrs. Mallard think they just might have found the perfect spot--no foxes or turtles in sight, plenty of peanuts from pleasant passers-by, and the benevolent instincts of a kindly police officer to boot. 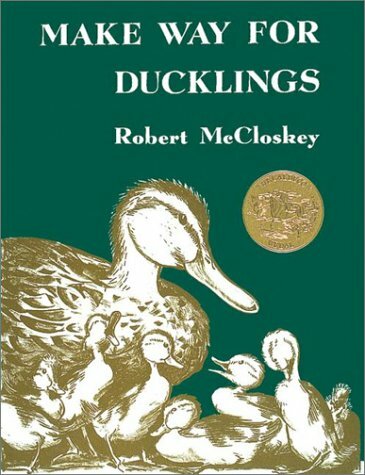 I've loved this story for years, since I first read it as a child. When I came back to it in a college literature class, I fell in love with it all over again. I'm not entirely sure what I like about the book so much. Maybe it's the sense of family, maybe the kindness of the police officer, maybe it's the beautiful setting. Regardless, this is a book that I love to reread over and over. Normally I prefer books with bright, colorful illustrations along the lines of Grace Lin's, but I sure love these illustrations. I love the tender way that the father, who has been away, reconnects with his daughter. His sensitivity to his daughter's feelings reminds me of my own father. The illustrations by Ibatoulline are gorgeous. While the colors are muted, as befits the fall season, the tender expressions on the faces of father and daughter are exquisite and put Ibatoulline on my list of favorite illustrators. I love Otis. There is not much more to say. I love to share this book with anyone who will listen. The students I've shared it with have really enjoyed it as well. Bright colors, catchy phrases, and choices, not to mention hamsters and cars, what more could one want? Beloved illustrator Ruth Sanderson offers a fresh, heartwarming twist to the classic story. In the new happy ending, Goldilocks makes up for her presumptuous infractions on the Three Bears' household by helping them make muffins with the berries she's picked from the woods near their home. Charming artwork--topped off with a tried-and-true recipe for homemade blueberry muffins--make this new edition of Goldilocks a story time treasure that is just right. 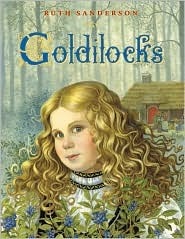 There are many versions of Goldilocks and the Three Bears. This one is my favorite, not just because of the gorgeous illustrations, but because Goldilocks actually apologizes and tries to make up for her poor choices. Plus, the blueberry muffin recipe makes my mouth water. Alexi, a young huntsman, is helped by a golden mare when he tries to perform the seemingly impossible feats commanded by the Tsar. 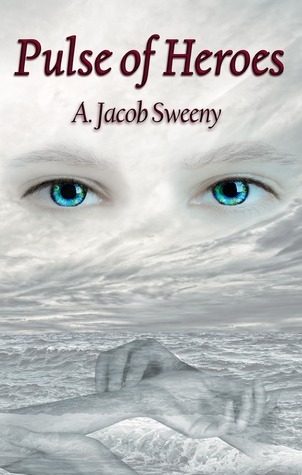 Will he be able to use his own powers at the end to save himself? 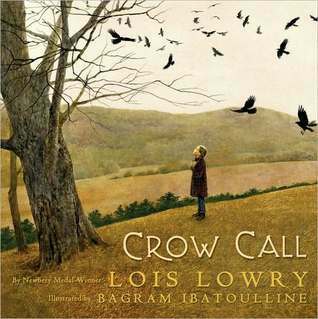 I love everything about this story, characters, plot, setting, gorgeous illustrations. I want to hop on the back of the horse and ride off into the sunset. 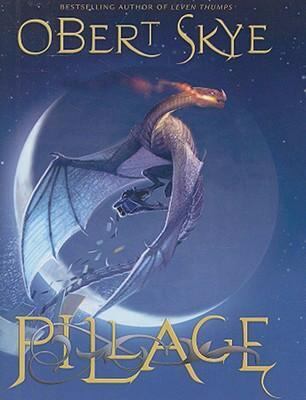 If there is one book I would want to hop into, this would be it, but only if I could have the golden mare. Here is the classic tale of elfin magic, loved by generations of children and made new by an artist of international acclaim. Jim LaMarche's stunning paintings, reminiscent of his earlier work in The Rainbabies, are the perfect compliment to this favorite Grimm fairy tale. Here is another folktale of which there are many versions. This is my favorite. The elves are adorable for one thing. 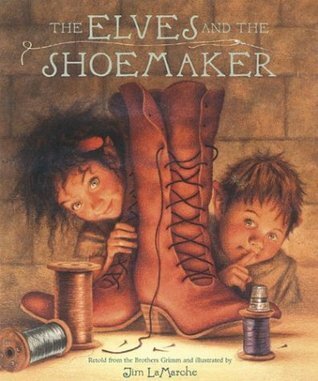 For another thing, the elves are clothed, in rags but clothed nonetheless, which makes me more comfortable sharing the book. Plus, Jim LaMarche's illustrations always have a sort of soft dreaminess to them which always pulls me in. They let me feel that for one moment in time all is right with the world. 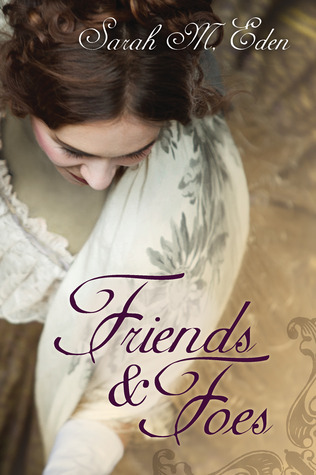 Mayer brings this beloved classic to life with all the splendor and romance of the story displayed in jewel-like paintings that sweep beautifully across the pages. 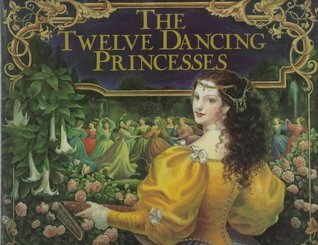 I confess that one of the reasons I love this versions of the well-known fairy tale so much is the gorgeous dresses the girls wear. Yes, I'm one of those girls who loved to dream of going to balls in beautiful dresses and twirling around, the prince was always secondary. :) I also appreciate the fact that the hero uses his brains and not his brawn. And yes, I do love the romance. Sigh. Now I need to come back to earth. 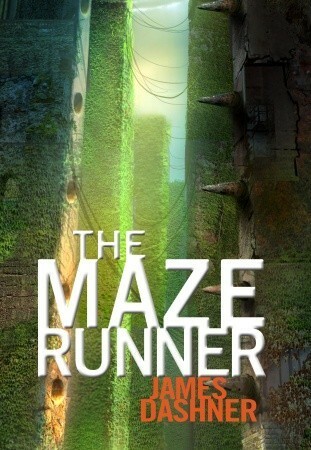 This book always gets me daydreaming. Lin Yi wants nothing more than a red rabbit lantern for the Moon Festival. But he knows that first he must buy the things his mother needs. Will he bargain well enough to have money left over for the lantern? 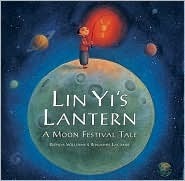 This touching story includes fascinating notes about the legend of the Moon Fairy, Chinese markets, and even step-by-step instructions for creating a paper lantern. 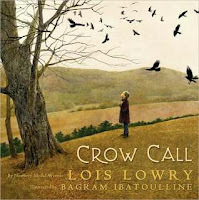 I just read this book last night, but I loved the tenderness of it. Lin Yi is such an appealing character. He tries so hard to bargain well so that he might have money left for the lantern he wants so much. I felt an immediate kinship with the young boy. After all, haven't we all wanted something that badly and then been disappointed when we couldn't get it? The illustrations beautifully show Lin Yi's experiences in the market. The most powerful illustration is the one that shows Lin Yi's disappointed face when he realizes he doesn't have money left to buy the lantern he wants. A sweet story of love and hard work. 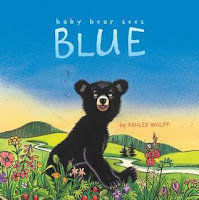 Explore the world of color with Baby Bear! Baby Bear has so much to learn about the world! From the moment he wakes until it’s time to curl up and go to sleep, he explores outside with his mama. They see green leaves, blue jays, brown trout, and—best of all—a patch of yummy red strawberries.From bestselling picture book creator Ashley Wolff, here is a clever concept book that combines engaging and intricate linocut illustrations with a story that enthusiastically encourages children to identify a variety of vibrant colors. Young readers will delight in this chance to join Baby Bear as he discovers the colorful wonders of his lively, leafy forest home. This book is just plain beautiful. I also really like how the mother bear gently teaches her baby about the world around him, but only after he has gone out and done some exploring on his own. As a teacher, I enjoy how eagerly students are to explore the world around them. Teaching is not a boring profession. This book is not only a great teaching book, but a tender exploration of the relationship between a mother and her child. 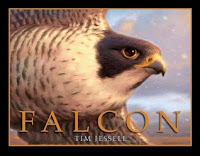 A young boy imagines what it would be like to fly as a falcon and see the world from on high. Soaring through the skies, he describes the sights and sounds of the world below. From snow-capped mountains to lush valleys, over rolling ocean and up rocky cliffs, Falcon will awaken the senses of every reader. 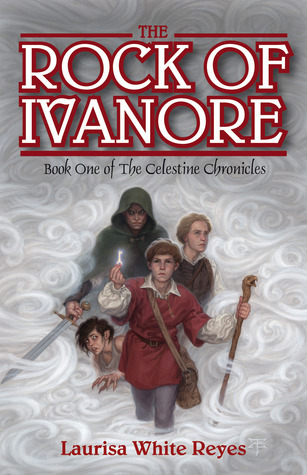 This book took me on a fabulous journey through clouds, past waves and cliffs, and down the side of a large building. 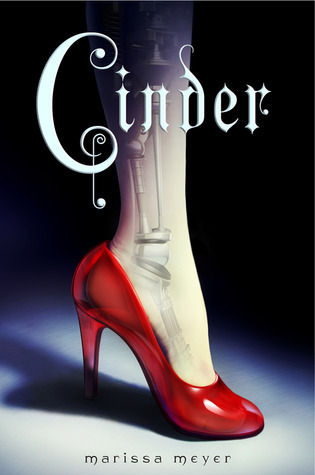 I love the premise of this one. The idea that one's imagination can take us anywhere is one I fully espouse. Plus, I've always thought that being able to fly would be a wondrous experience. Too bad I'm afraid of heights. Oh, well, I can always fly in my imagination. The panoramas in this book are incredible by the way.